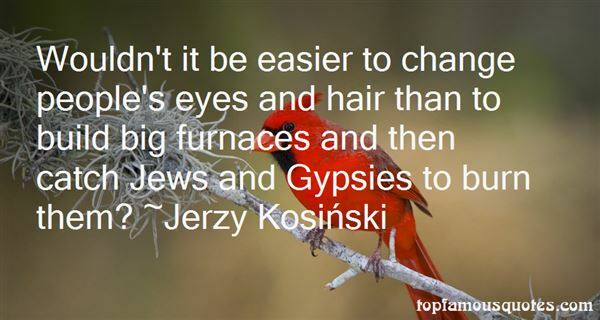 Reading and share top 32 famous quotes and sayings about Gypsies by famous authors and people. 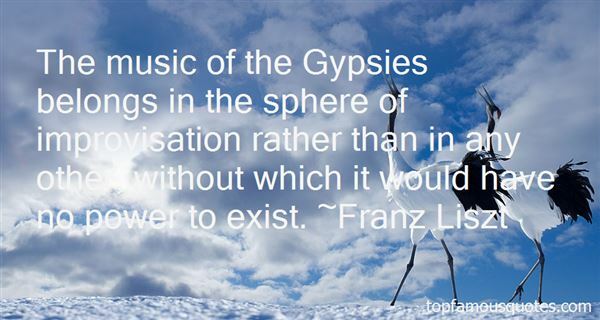 Browse top 32 famous quotes and sayings about Gypsies by most favorite authors. 1. "Jennifer now understood the meaning of the cadence: the black and white drawing, the watercolor painting,and the notes. The cadence had at last developed into a concerto for violin, the instrument of gypsies, with a prevailing rhapsodic "leitmotif". The final movement had revealed itself when they were at the gypsy camp. And now it was complete." 2. "First of all, they came to take the gypsiesand I was happy because they pilfered.Then they came to take the Jews and I said nothing, because they were unpleasant to me.Then they came to take homosexuals,and I was relieved, because they were annoying me.Then they came to take the Communists,and I said nothing because I was not a Communist.One day they came to take me,and there was nobody left to protest.Bertold Brecht, inspired by Emil Gustav Friedrich Martin Niemöller"
3. "Today's Gypsies, who have lived in Prague for only two generations, light a ritual fire wherever they work, a nomads' fire crackling only for the joy of it, a blaze of rough-hewn wood like a child's laugh, a symbol of the eternity that preceded human thought, a free fire, a gift from heaven, a living sign of the elements unnoticed by the world-weary pedestrian, a fire in the ditches of Prague warming the wanderer's eye and soul." 4. "My own personal favorite Cher song is the unforgettable Gypsies, Tramps and Thieves." 5. "Gradually the idea for a book began to take shape. It was to be a wildly ambitious and intolerant work, a kind of 'Anatomy of Restlessness' that would enlarge on Pascal's dictum about the man sitting quietly in a room. The argument, roughly, was as follows: that in becoming human, man had acquired, together with his straight legs and striding walk, a migratory 'drive' or instinct to walk long distances through the seasons; that this 'drive' was inseparable from his central nervous system; and, that, when warped in conditions of settlement, it found outlets in violence, greed, status-seeking or a mania for the new. This would explain why mobile societies such as the gypsies were egalitarian, thing-free and resistant to change; also why, to re-establish the harmony of the First State, all the great teachers - Buddha, Lao-tse, St Francis - had set the perpetual pilgrimage at the heart of their message and told their disciples, literally, to follow The Way." 6. "But unlike Sir Sith's other childhood dreams--dating Dame May Whitty, driving two race cars at once, being voted King of the Gypsies--this one has come true." 7. "Clowns, hoboes, gypsies, and furry animals of all kinds scattered madly and dived for cover. No doubt they thought I'd finally lost it and was planning to lob more grenades." 8. "We Gypsies know that where Jews are killed, Gypsies are always murthered too. And then a lot of other people, usually." 9. "The music of the Gypsies belongs in the sphere of improvisation rather than in any other, without which it would have no power to exist." 11. "Drowned in the lake, ravished by gypsies, struck by a passing motor car, she thought ritually, a sound principle being that nothing was ever as one imagined it, and this was an efficient means of excluding the worst." 12. "In those days I had various strong inclinations, for wine, gambling and cockfighting, and the society of gypsies, together with a passion for theological discussion which I had inherited from my father himself—all of which my father thought I had better rid myself of before I married." 13. "Wouldn't it be easier to change people's eyes and hair than to build big furnaces and then catch Jews and Gypsies to burn them?" 14. "Once there was a gypsy queen who wore on her wrist a chain of six lucky charms - a golden crown, a silver horse, a butterfly caught in amber, a cat's eye shell, a bolt of lightning forged from the heart of a falling star, and the flower of the rue plant, herb of grace. The queen gave each of her six children one of the charms as their lucky talisman, but ever since the chain of charms was broken, the gypsies had been dogged with misfortune." 15. "Only the candles and the soap were of German origin. They had a ghostly, opalescent similarity. The British had no way of knowing it, but the candles and the soap were made from the fat of rendered Jews and Gypsies and fairies and communists, and other enemies of the State. So it goes." 16. "The gypsies were a special breed. It wasn't blood that flowed through their veins but rhythm." 17. "It was a bold, wild life for a faerie - most never even left their forests - but she was a bold, wild lass, and so were her daughter and granddaughter after her, and their place in the world was everywhere and nowhere, like gypsies on wing. No home had they but their caravans and campfires, and no family but the one they'd cobbled together of crows, creatures and kindred souls they'd met on their endless journey round and round the world." 18. "If you married me,it would be scandalous and innapropriate, and doors would be closed to you. ""Good God, woman, I let two of my sisters marry Gypsies. Those doors have already been closed, bolted, and nailed shut." 19. "For gypsies do not like to stay -They only come to go away." 20. "His shoulder-length hair was a rich, dark-brown color with a slight wave to it and it flowed behind him as he ran into the center of the gypsies. He was tall, muscular, and so beautifully handsome, yet primal. He looked magnificent." 21. "Oh, now look what you've done. You've gone and pissed him off," Breccan said as he stood behind two of the gypsies, one of his large hands clamped down on each of their shoulders." 22. "The gaja might despise the Romany, but no Rom ever forgot his dead. For him, roaming over the earth were not only the half million Gypsies who drew breath but also the countless Gypsies who had gone before, restless spirits still wandering through cities and deserts, still real." 23. 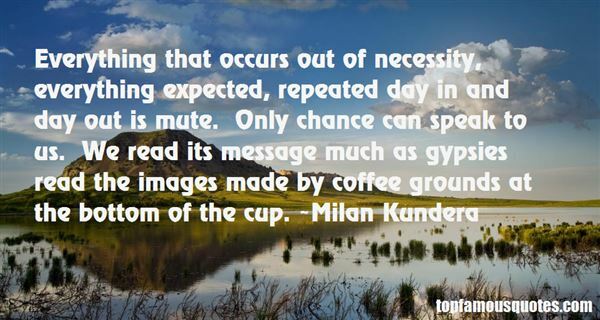 "Everything that occurs out of necessity, everything expected, repeated day in and day out is mute. Only chance can speak to us. We read its message much as gypsies read the images made by coffee grounds at the bottom of the cup." 24. "He ran down the heart of the old midway, where the weight guessers, fortune-tellers, and dancing gypsies had once worked. He lowered his chin and held his arms out like a glider, and every few steps he would jump, the way children do, hoping running will turn to flying. It might have seemed ridiculous to anyone watching, this white-haired maintenaance worker, all alone, making like an airplane. But the running boy is inside every man, no matter how old he gets." 25. "Most communities attempting to survive under irresistible pressure from a dominant culture develop a myth that allows them to believe they are somehow a special people. Chosen. Favored by the gods. Gypsies, Jews-- plenty of historical precedents"
26. "The stuff of nightmare is their plain bread. They butter it with pain. They set their clocks by deathwatch beetles, and thrive the centuries. They were the men with the leather-ribbon whips who sweated up the Pyramids seasoning it with other people's salt and other people's cracked hearts. They coursed Europe on the White Horses of the Plague. They whispered to Caesar that he was mortal, then sold daggers at half-price in the grand March sale. Some must have been lazing clowns, foot props for emperors, princes, and epileptic popes. Then out on the road, Gypsies in time, their populations grew as the world grew, spread, and there was more delicious variety of pain to thrive on. The train put wheels under them and here they run down the log road out of the Gothic and baroque; look at their wagons and coaches, the carving like medieval shrines, all of it stuff once drawn by horses, mules, or, maybe, men." 27. "Anarchists did not try to carry out genocide against the Armenians in Turkey; they did not deliberately starve millions of Ukrainians; they did not create a system of death camps to kill Jews, gypsies, and Slavs in Europe; they did not fire-bomb scores of large German and Japanese cities and drop nuclear bombs on two of them; they did not carry out a ‘Great Leap Forward' that killed scores of millions of Chinese; they did not attempt to kill everybody with any appreciable education in Cambodia; they did not launch one aggressive war after another; they did not implement trade sanctions that killed perhaps 500,000 Iraqi children.In debates between anarchists and statists, the burden of proof clearly should rest on those who place their trust in the state. Anarchy's mayhem is wholly conjectural; the state's mayhem is undeniably, factually horrendous." 28. "Gypsies make difficult friends for ordinary people, and he was seething of a gypsy." 29. "All my family back to the 1700s were water Gypsies. My brothers and me, we were the first ones to be born on dry land. All the rest of them were born on barges in the canals." 30. "The term bohemian has a bad reputation because it's allied to myriad clichés, but Parisians originally adopted the term, associated with nomadic Gypsies, to describe artists and writers who stayed up all night and ignored the pressures of the industrial world." 31. "The prom's music came from this really bad cover band called The Gypsies of the Allegheny,"
32. "Sure, we need the gypsies. we always have. because if you don't have someone to run out of town once in a while, how are you going to know you yourself belong there?"